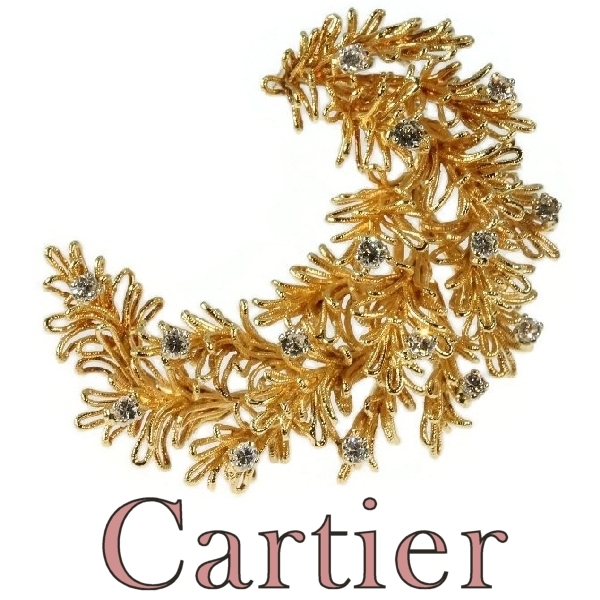 Cartier diamond and yellow gold brooch Cartier Paris: Description by Adin Antique Jewelry. Imagine this festive Estate brooch in 18K red gold by Cartier with every of its twilled threads curved into countless leafs swaying in the cadence of your every move. Looking at the 15 evenly dispensed brilliant cut diamonds, this jewel sprouts pure luxuriance as if it were a branch grown from a gold soil. No need to stay grounded after one silky stroke of this feathered bow. A group headed by Robert Hocq (1917-79)acquired from the Cartier family the branches in Paris (1972), London (1974), and New York (1976). Hocq was Managing Director until his death when he was succeeded by his daughter, Nathalie (b. 1951),who since 1974 had headed the high-fashion jewelry department and promoted the boutique collection of jewelry known as Les Musts'. Originally the firm made jewelry of enameled gold set with gemstones, which attracted a prestigious clientele, including French royalty and the future Edward VII;in recent years it has greatly expanded into new types and styles of jewelry, and is extending its world-wide operations. Diamonds: 15 brilliant cut diamonds with a total estimated weight of approx. 1.10 crt. Total diamond weight: approx. 1.15 crt.